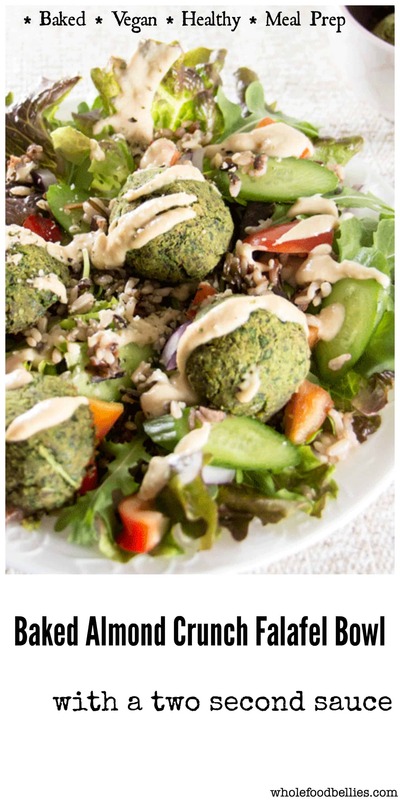 Treat your body with this Baked Almond Crunch Falafel Bowl accompanied by a dressing that seriously takes two seconds. Prepare in advance and enjoy! I really love big hearty soups and stews around this time of year. Especially on super cold and rainy nights like tonight. However, after a couple of weeks I start getting that heavy feeling (not literally, hopefully) and really feel the need to throw a few lighter meals back into the rotation. Here’s where the falafel come in. They are still nice and hot from the oven, and for me, they are still totally comforting. But, when paired with some rice and lots of fresh, raw veg, they take on a lighter note, which is a much appreciated break from the heavier fare. They are also great little snacks to have on hand for rolls, wraps and sandwiches throughout the week, and therefore make great little meal prep companions – great for those of us trying to make a better effort at meal prepping in the new year. I tend to pair my falafel with whatever I have on hand in the crisper. But, as a rule of thumb, there is always some form of lettuce, some type of crunch (cucumber, red pepper etc), some onion for a bit of bite, and a nice zesty sauce. I like to make a nice tahini based dressing, and for this bowl I am going to share my sneaky no fuss two second sauce with you, as I know you are all super busy, and need something quick. Are you ready? Hummus, lemon juice, and water….that’s it. I use it in so many salads and wraps, and it seriously is delicious and takes no time at all. Try this Baked Almond Falafel Crunch Bowl and lighten up your holiday season in a totally delicious way. Lighten up your week with some baked almond crunch falafel bowls served with my two second dressing. Options to prep in advance too. I love falafel, what a great idea to bake it in the oven and use it in a salad, sounds like a delicious combination! Thanks Joy! They work so well baked. I have been in a salad rut for a while now. I think this is what I need to pull me out of it. You have to try falafel again Pam, it is so delicious! This sounds so yummy & light! I feel you on the heavy stuff especially because it’s still hot in Arizona so this is a nice break from the heavy stuff! I can imagine it would be hard to stick to traditional holiday fare while it’s still hot! In Australia, we just gave in and had fresh seafood and salads at christmas! This would make a wonderful lunch. Perfect for the days when we want to get away from the heavier meals of the holidays. Love the colors. This is a fantastic use of falafels! I love this food and have yet to make it. Your creation looks beautiful and delicious!! I’m in love with these. It would be so easy to double the batch and freeze some for later. I will be sure to give your dressing a try, too. That is exactly what I do Lydia (well I try to, but the second batch never make it to the freezer!). The dressing is seriously delicious, and so so easy! I love falafel, but have never thought to make it. always find that I end up with a bit too much hummus when I make it so this looks like a delicious way to use it up. Yes, this is a great way to use up leftover hummus!! I need this in my life! For no other reason that they are so pretty and it sounds like they taste pretty amazing too ! Yum !